This young girl walks barefoot along a sandy beach, carrying a basket filled with nets and fishing gear. It is the image of a daily chore which, far from wearing her down, keeps her feeling happy and free. Her figure does not darken the ground with shadows, nor do her feet leave prints in the sand. There is nothing to indicate that the weight of the basket oppresses her; on the contrary, everything about her has an almost unreal lightness, like the purest of hopes. 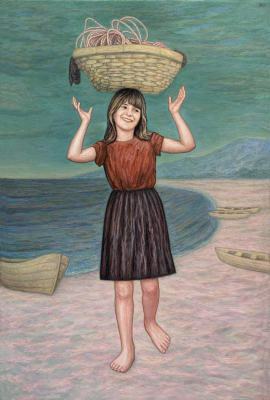 She lifts one foot to take a step, removes both hands from her basket, and the act of balancing brings with it a smile. This painting and the work entitled Maternity (V) offer two expressions of pleasure with a certain affinity between them.